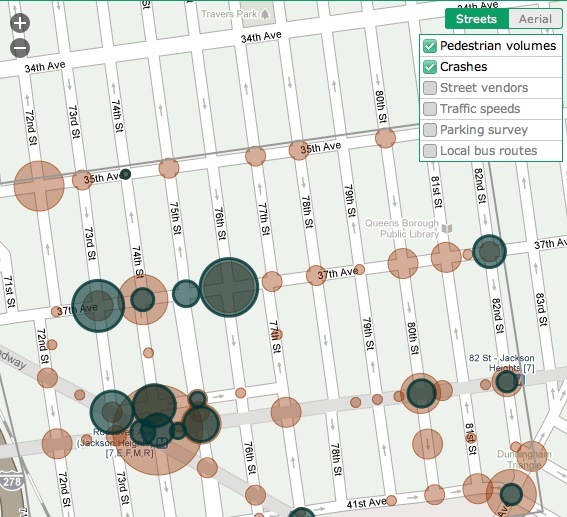 DOT's ##http://a841-tfpweb.nyc.gov/jackson-heights/map/?zoom=16&lat=40.74826&lon=-73.889&layers=B0FFFTFFTTT##new interactive map## of Jackson Heights, displaying the number of traffic crashes and pedestrian volumes at certain intersections. NYC DOT’s Jackson Heights Transportation Study already has some of the snazziest online resources of any department project, but to get the full scoop on the changes due for the neighborhood, head over to one of the two public meetings being held tomorrow. DOT says that the plan, developed at the request of neighborhood groups, will include improvements targeted at easing congestion, improving pedestrian and bike access, speeding bus service, making the streets safer, adding badly needed community space and tackling the thorny issues of parking and deliveries. The scope of that list suggests an exciting project. Tomorrow’s meetings will offer a chance to sit down with DOT officials and other community members, work through the plans and offer feedback. The two sessions will be held from 10 a.m. to noon and 1 p.m. to 3 p.m. at P.S. 69, 77-02 37th Avenue (between 77th and 78th Street).